LAS VEGAS (Nov. 21, 2015) — It was a dream weekend for Jared Mees. One night after winning the 2015 AMA Pro Grand National Championship, the 29-year-old from Clio, Michigan, came through to score victory in the first ever Superprestigio of the Americas presented by Yamaha, Saturday night in the Orleans Arena. Mees, riding a Honda CRF450R, proved the toughest rider among the eight-rider field on the rough and tumble Chris Carr-designed short track. Brad Baker, of Eatonville, Washington, and Kenny Coolbeth, Jr., of Center Hill, Florida, both on Hondas, rounded out the podium finishers of the special race that brings together riders from various motorcycle racing disciplines. All three of the podium finishers are former or current AMA Pro Grand National Champions. Mees battled with early leader Baker for the first four laps. The pivotal moment in the race came on lap five when the leading duo made contact coming out of turn four and Baker’s motorcycle nearly climbed the outside retaining wall. Somehow Baker managed to keep from crashing, but he lost touch with Mees, who cruised home to a 1.514-second margin of victory in the 15-lap race. The top non-flat-track finisher was former AMA and World Superbike competitor Larry Pegram, of Hebron, Ohio, who finished fourth on a Honda. Racing prodigy Joe Roberts, from Los Angeles, also a road racer, rounded out the top five. 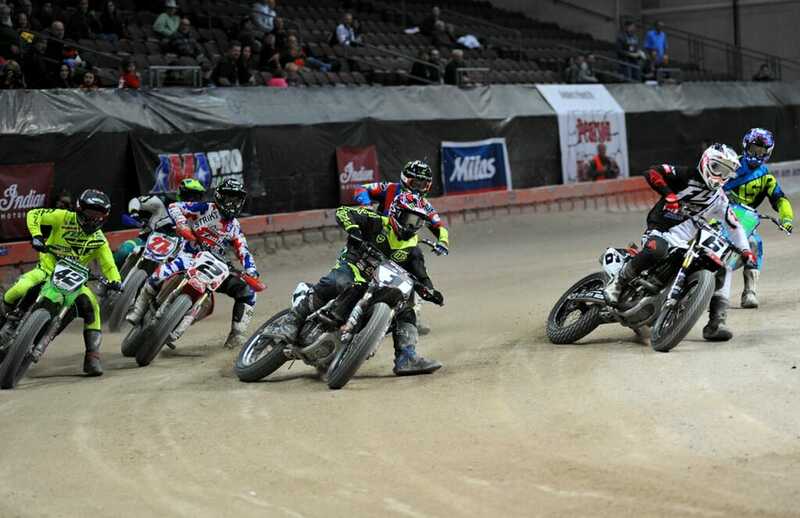 Results of the Superprestigio of the Americas, Orleans Arena, Nov. 21, 2015 1. Jared Mees, Honda. 2. Brad Baker, Honda. 3. Kenny Coolbeth, Jr., Honda. 4. Larry Pegram, Honda. 5. Joe Roberts, Yamaha. 6. Oliver Brindley, Kawasaki. 7. Roger Hayden, Suzuki. 8. Bryan Smith, Kawasaki.